4 meter screens above hired out at SunCoast Conference Centre Venue. This function catered for 700+ guests at this Conference. A projection screen is an installation consisting of a surface and a support structure used for displaying a projected image for the view of an audience. Projection screens may be permanently installed, as in a movie theater; painted on the wall; or semi-permanent or mobile, as in a conference room or other non-dedicated viewing space such as an outdoor movie screening (open air cinema). Uniformly white or grey screens are used almost exclusively as to avoid any discoloration to the image, while the most desired brightness of the screen depends on a number of variables, such as the ambient light level and the luminous power of the image source. Flat or curved screens may be used depending on the optics used to project the image and the desired geometrical accuracy of the image production, flat screens being the more common of the two. Screens can be further designed for front or back projection, the more common being front projection systems, which have the image source situated on the same side of the screen as the audience. Projectors have advanced greatly over the years. Things have come a long way since the "Zoopraxiscope" was presented to a wondering public in the 1870s. This was a glass disk with images etched upon it that was spun around while light shined through it. It made images appear to move. Even a shadow puppet on a wall might be thought of as a forerunner of the projector. In many ways, the idea is the same; a light shines through a medium and the medium creates recognizable images on a wall or screen. Put two fingers before a flashlight, move it up and down, and you have a projection of a bunny. After the Zoopraxiscope, such renown names as Lumiere and Edison appear. Lumiere developed the Cinematographe (1895) and Edison presented his Kinetoscope (1891) and Vitascope (1896), inventions which eventually led to films being presented to the paying public. Soon projectors of information other than films and documentaries became popular. Slide projectors came into homes - the slides had to be specially made by development laboratories. But the cost of this was soon brought into reach of most Americans by the Kodak corporation. Slide projection devices, with their preloaded carousels, soon found their way into business presentations. But for interactive projection nothing beat the overhead projector which featured a lighted base, with clear sheets, the same size as paper, that could be printed with images and even written on by a lecturer as viewers watched from their seats. The image was projected up to a triangular shaped device that turned the image and projected it onto a wall or screen. The days of teachers, their faces lit with eerie low-level lighting, scribbling on a clear sheet as students looked on is etched in the memory of a whole generation of students. Though overhead projectors may still be found here and there, they have mostly been thrown over for the new LCD and DLP projectors. These are light-weight, but still have powerful projection ability. They are also versatile in that they may be connected to many different devices. One popular use of the projector is in the home. This is a surprising development to some, but it simply makes sense. A projector might be purchased instead of a large screen TV. The projector can project even the most mundane television show on a large screen or even the wall. This is normally less expensive than buying a large screen HDTV, but does an impressive job of presenting sporting events and movies. Of course, light-weight projectors have become almost a required part of the baggage of sales and business people who must travel and make presentations. Fairly spectacular multi-media presentations can be created using Microsoft's PowerPoint or some similar tool. Civic organizations and governmental bodies as well as the military have all found uses for projectors in making briefings, informing people of ancillary information at meetings and more. Churches are jazzing up their services with projectors. Using multimedia to get their message across. Some have even given up printing bulletins and now conduct their entire service with Powerpoint. This saves on paper, allows for last minute changes, and also saves labor. Projectors are even used by clubs and other organizations. At chess tournaments, projectors are used to show an audience the position of play as well as the time remaining on the chess clock. Projectors can even be used to create holiday displays, and decorations for events such as weddings and parties. If you are planning to acquire a projector for these or any other reasons, you will want to have a more intricate knowledge of the basic features available on projectors. StageGear Rentals offers Video and Visual playback equipment for any situation, Best Man's Speeches, Training and Corporate Seminars and Awards Events. 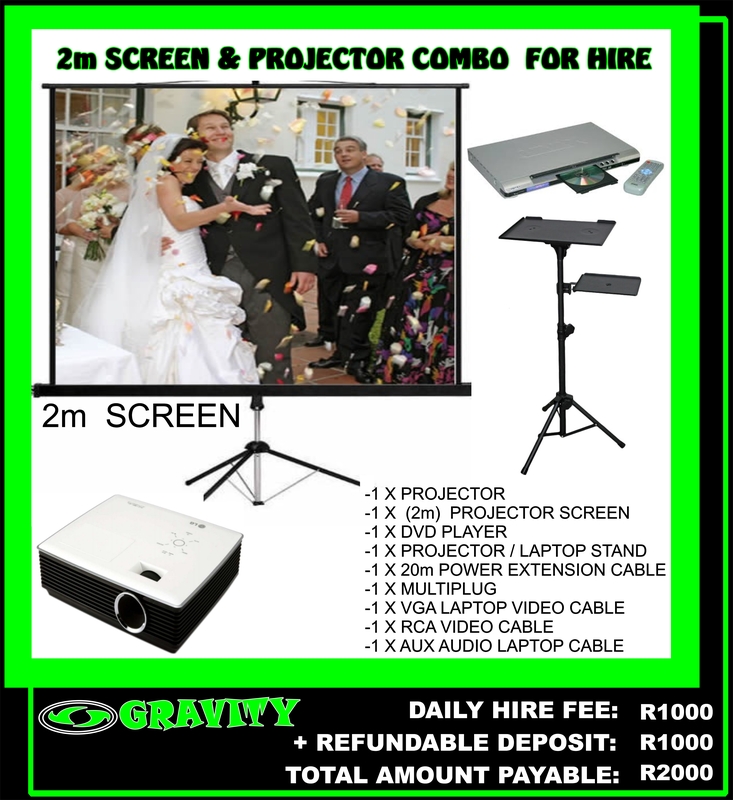 Our inventory includes; DVD Players, LCD Projectors, 42" Flat screens and screen sizes from 6ft to suit any environment. We also provide all the necessary switching, linking equipment and cabling for these systems. Marquee Venues (daytime): It is recommended that multiple Flat Screens are used in Marquee venues due to the high ambient light levels that are normally associated with these structures. The visual content of presentations has increased significantly with Lighting and Video starting to share ideas and technology. Our Video equipment not only provides our corporate and wedding clients a means to present their message, it also enhances theatrical productions that want to explore a more dynamic approach. Best Mans Speeches - It is becoming more popular for the best man to enhance his speech with the aid of visual presentation, usually in the form of photographs, (but could also be video), of the grooms past. Wedding Photo and Video Playback - With the digital age of photography it is also more popular these days to show a slide show, (or video playback), of the Wedding Ceremony earlier in the day. Training and Corporate Events - Using Power point Presentations etc. to assist with getting your message across in a more interesting way. Awards Evenings / Events- Using Power point Presentations and Video playback to show information about the nominees and winners. Event Relay - Incorporated with a PA system, this could be an event that needs to be shown to people outside of the main presentation area, for example: a public meeting or a church service. Advertising - Screens are also useful for advertising companies or products at your event, this could also be used to generate some income for the event or charity. 42" Plasma or LCD screens are a common way of displaying Laptop Presentations or Family Photos at a wedding. Any number of screens can be used to display individual presentations and films, or the screens can be linked to provide a simultaneous display of the same presentation or film. Ideal for Corporate or Training Presentations. Great for use at Weddings, Anniversaries or Birthday Functions to display family photos from your laptop. StageGear Rentals can supply both standard output LCD projectors (approx 2000ANSI Lumens) and high output projectors ( above 4/5000 ANSI Lumens) to fit a range of situations including rear projection. Projectors can be placed on standard projector stands or mounted on a Truss or Marquee structure. The most popular screen size is approx 6ft in width, although larger are available. Projectors can display DVD, Camera or Laptop Presentations, which can also be mixed with a video mixer for an enhanced display. The Rapidfold screen is ideally suited for any large projection solutions. The Rapidfold frame has been engineered to make installation simple. Whether for a permanent installation or for the demands of event hire the Rapidfold screen is designed with longevity in mind. The unique lightweight 'one piece' frame installs in seconds without the use of tools. The frame comprises of a rugged aluminium frame with multiple easy locking joints, and quick release mechanisms so that the screen can be installed in seconds. The Matt White, Flame retardant and mildew resistant Fabric is attached to the frame with a quick release popper system (dome and grommet). The screen fabric has an 85mm thick Black border surround which increases the perceived clarity of projected image and it's durability. Truss and Frame included, the screen is also supplied with rugged carry case equipped with wheels. LED Screens are are made up from tens of thousands of tiny LEDs, making them suitable for use in bright environments where a vibrant colourful image is required. StageGear Rentals can supply not only the screens or projectors but the equipment to produce high end video switching, mixing and distribution of VGA, RGB/YUV HDMI etc. signals. The latest edition to our portfolio being the Kramer VP747 video switcher scaler. 8 inputs to Live and Pre-view outputs. Inputs can be a mixture of equipment including Video Cameras, Laptop or PC's, DVD players to provide an extremely professional corporate presentation and awards ceremonies. Using state-of-the-art technology and a host of professional personnel, we bring sight and sound to life. Our vision is to provide all of our clients with superior service at a fair price. At Sight & Sound we have many LCD projector rental models available to rent. Renting projectors from our company is fast and easy. 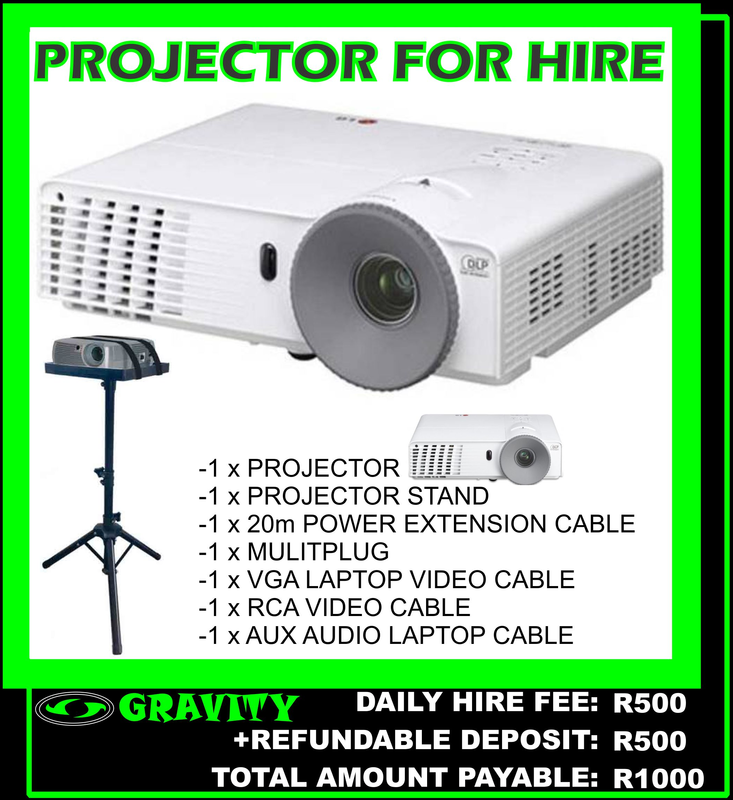 We have digital projector rentals available for powerpoint presentations, DVD shows and business meetings. We can also offer delivery and set up the projectors as part of your rental. We rent and lease projectors to businesses and to individuals. Our clear and easy to use projectors will make your presentation brighter, flow smoothly, and lave you with peace of mind that the presentation will be seen and retained by the viewers. All offer power zoom and focus, digital keystone correction and remote control units with laser pointer. These compact projectors are perfect for rentals or installation, including ceiling mounting, in medium to large venues. Try one of our projector rentals today for a better image in your meeting. Sight & Sound offers many name brands such as Hitachi, Infocus, Epson, Mitsubishi, NEC, 3m, and many more. Call one of our representatives today for a rental quotation. We carry portable tripod screen rentals from 50" up to 100" (or about 4' to 8' wide) and large fastfold screens to 9x12. These projector screen rentals are great for small, medium and large presentations for groups of 10 or 1000! They are easy to transport and setup and give you a nice professional image. Tripod screen rentals from 50" to 100"
We also offer complete setup and removal services throughout Durham region and the GTA, so if you have a conference, trade show, seminar, corporate training or other program, we can setup breakout rooms or a general assembly at the facility of your choice. Need a single portable projector screen for an out-of-town meeting? No problem! Looking for a large fast-fold projector screen for your wedding? No problem. Rent your projector screens from Sight & Sound and let us handle the details. For conference situations, keep in mind you need one screen for every projector, so if you have multiple breakout rooms you will need multiple projector screens. It is usually cheaper to rent a screen from Sight & Sound than through the hotel or facility where you have your event. THIS IS A HUGH SCREEN, ideal for a big venue. this will definately impress your guests. 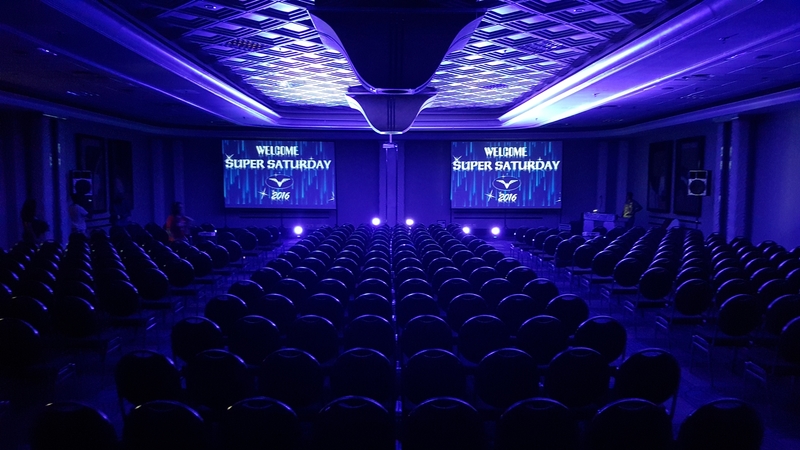 When looking to add a touch of modernization and personal impression to an event a great way of getting this done is through the use of LED screens. A LED screen operates just like a giant LCD television screen except that the pictures and images that are displayed are made up of a cluster of tiny LED pixels (as upposed to being beamed from a cathode ray tube). 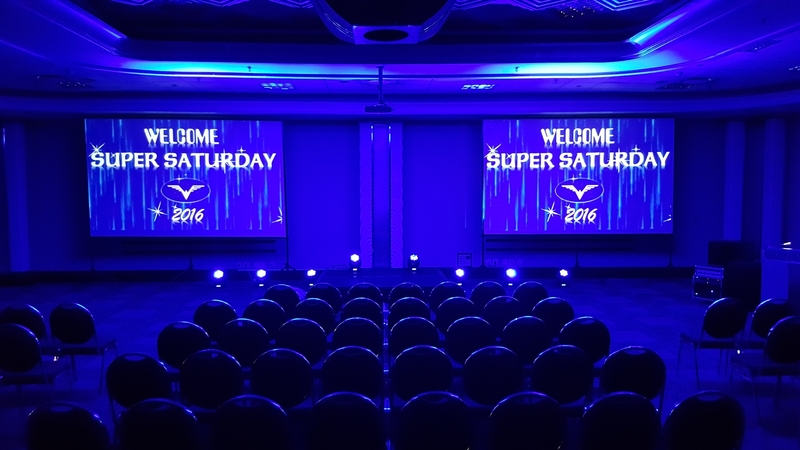 Virtual productions provides indoor LED screens and outdoor LED screens for rental and hire purposes throughout South Africa. LED screens are ideal to use for any outdoor viewing; they are actually designed to be visible in bright sunlight and have far better clarity than regular screens. They are great for large displays or big screens and are brighter than LCD screens, and therefore are more impactful and effective. Having an LED screen at an event is also a simple and relatively easy process to get done because the LED screens are made of individual panels that can be seamlessly put together, the screens themselves are durable and robust- designed for more frequent handling and transportation. An LED screen can be used at any musical event or function to create a backdrop of colour and design for those performing, it can be used at a wedding as a source to display personal photographs or information about the couple getting married. At corporate functions you can use them as a means to advertise and display company information, videos and presentations. Their uses are wide and varied, and their impact is strong and has a significant presence, not even would be the same without the use of an LED screen. Virtual Productions owns and operates a range of indoor and outdoor LED screens that is available for rental and hire purposes. All the screens are hired with competent crew and all other event equipment that is required to operate the screens. The projector stand elevates a projector for the best angle of projection. It will simplify any projector setup. Available with foldable legs for portability. Overhead Projector Rental Just like you used at school and university! Still widely used today. The presenter writes onto a transparency, lays it on the projector glass which is then projected onto a screen or wall. If you are looking for a projector to connect to your laptop, see Data Projectors on this site. Planning a conference? Launching your new product? Show off baby videos at a 21st party? C&S stocks projectors and screens for all types of events. contact us now for the perfect projector solution. Projection on screen for indoor party What is a projector? In the most basic sense a projector is a piece of equipment that takes a signal and converts it into light and projects an image onto a screen or other flat surface. 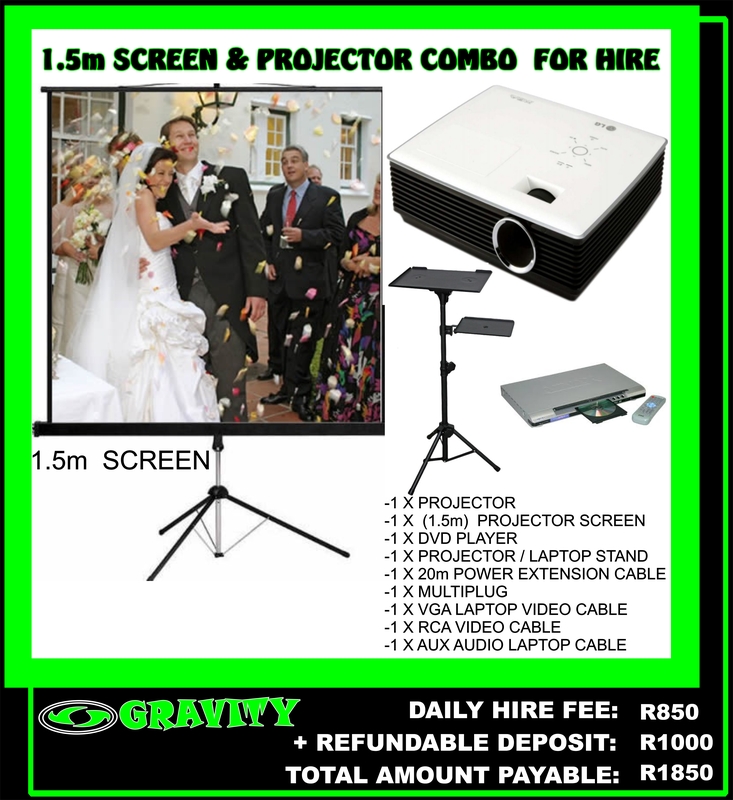 When renting a projector, we will advise which type will give the best and most cost effective result for your needs. Contact us for more information. Projector and screens for corporate event What can projectors be used for? Use of projectors and projection possibilities are almost endless - from boardroom meetings to large events for thousands of people! Today, just about any signal can be displayed by a projector on a screen. Laptops: presentations, photos, video clips, or even a live feed so people can watch what you are doing while you are doing it! C&S also stocks projectors that can handle HD / SDI signal. Projector brightness is measured in ANSI Lumens, and it is important to rent the right projector for the right purpose. Circular screen To compliment our extensive audio systems and professional lighting and structures range, we also offer audio visual services, equipment and all accessories needed for a professional and powerful visual experience. Indoor or outdoor, formal or informal - we have the perfect screen for the job! C&S also supplies vision mixing equipment and monitors as well as scaling equipment, laptop computers and DVD players. From boardroom presentations to large conferences and outdoor events: C&S will project the right image for you! Looking for a great deal for Projector Hire? With the use of projectors and the power of video display systems, AV Direct can magnify the presentation and impact of any event that it lays its hands on. 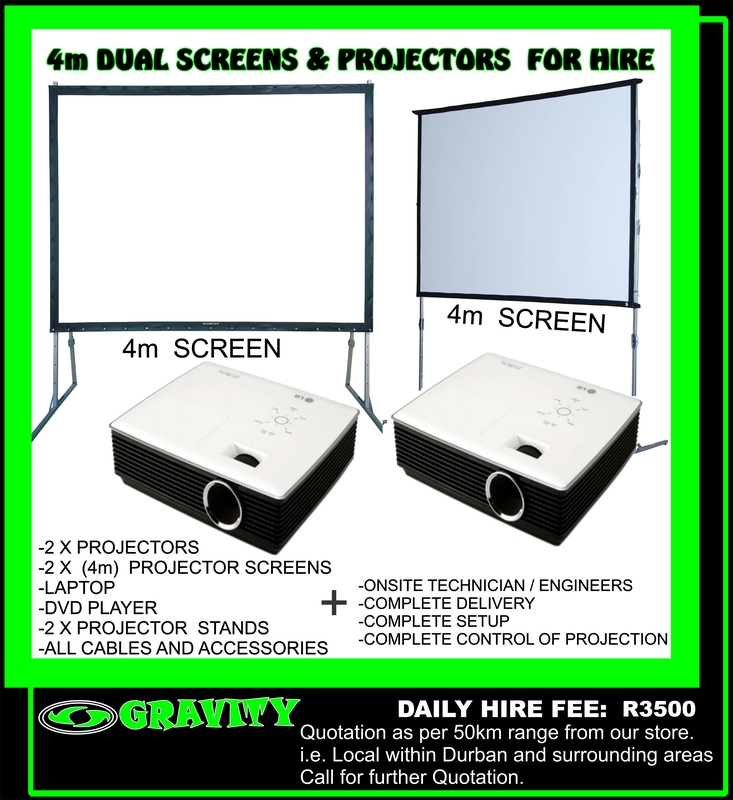 We supply superior products for our Projector Rentals in Cape Town & Johannesburg and also offer the widest selection of projector screens for your convenience and suitability for hire or installation. From the Sanyo 6500 lumen projectors that we can utilize in front or rear projection to various crystal clear 32”/42”/50”/60”/65” LCD Screens that can display uniformed images through DVD Players / Laptops / PC’s and our data distribution amplifiers. Rest assured that our video display systems will allow your visions to become reality. We are proud to announce to all of our clients that AV Direct only supplies superior and top class products for our projector rentals. We supply superior video and data projectors for hire and installation, from boardroom presentations to exhibitions. AV Directs supplies projection screens, portable big screens and LED screens for hire and installations from trusted brands like Grandview, Draper and Da-Lite Screen systems. Our projector screens for hire are lightweight yet exceptionally stable, with folding aluminum frames and skirting that fit into a case for convenient transport and also include front and rear projection surfaces. A projector screen installation consists of a surface and a support structure used for displaying a projected image for the view of an audience. Projector screens may be installed permanently, as in a movie theatre; they can also be painted on walls using a special projection screen paint; or portable as in a conference room or open air movie screening. White or grey screens are used almost entirely as to avoid any staining to the image, while the desired brightness of the projector screen depends on a number of variables, such as light level and the power of the image source. This brightness is very effective for conferencing in a larger venue and can then also be used for the conference gala dinner. Renting a projector of this brightness is also perfect for larger corporate events like product launches and award ceremonies as well as fashion shows and indoor sport viewing. These projectors are perfect for large scale corporate events and conferences, live concerts, dance experiences, sport viewing and big parties. The darker the venue, the brighter the image. Light can have a big effect on the image brightness on the screen. For example, if the conference venue has big windows and no curtains or the event is during the day or the conference requires house lights to be on during presentation, a brighter projector is needed than for a film festival screening at night with the lights off in a venue with heavy curtains. The better the quality of the projector, the better the quality of the image. In other words, the better the quality of the projector, the higher the resolution. A higher resolution means more pixels. In basic terms that means that there will be more dots of light per square inch and the higher the number of dots the projector projects, the better the quality, colour and definition of the image on the screen. Contact C&S now for a free quotation for your event! We will project your image perfectly! Outdoor LED screen at MTV Base show. Testing LED screen at MTV Base show. Social media on indoor LED screen. Outdoor stage hire for concert production, festival production, event production, live sound hire and sound production hire for any festivals or corporate events is available through AV Direct. Our integrated technical production services and national footprint across South Africa, allows us to offer a complete range of staging and structures for hire including mobile stage hire and promotional units. We have all of necessary flexibility to answer quickly to any request; whether it is a single event or national road shows. We have multiple stage systems to accommodate any situation, event, or structure requirement. We can provide the platform that is right for you, our staging and structures are compliant with all safety regulations. Our stage rental solution offers creative and innovative stage designs. Just let us know your idea, and we will use our resources to design it for you. 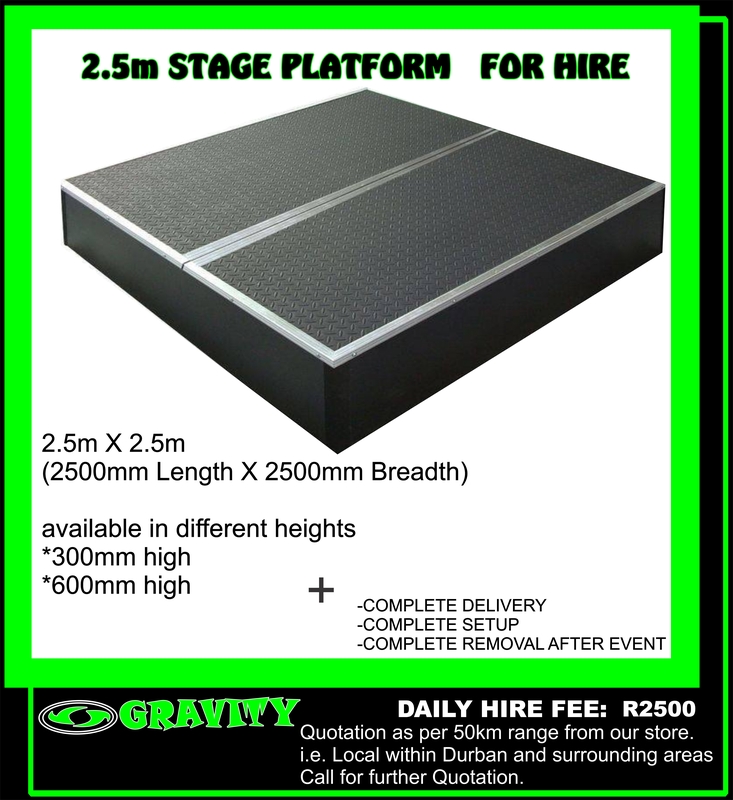 Stage Hire has never been easier, we are there to help you! Although we are based in Cape Town, AV Direct operates on a nation wide scale across South Africa and offer our stage rental solutions from Cape Town to Johannesburg – complete with setup and installation of lighting, sound, stage equipment or any other Audio Visual service you require! Stages can be assembled and taken apart in a relatively short amount of time and set up almost anywhere – e.g theatres and lobbies are the perfect setting for a wide array of events. Stage rentals are very useful for showcasing events such as presentations or even catwalks and runway modelling. From displays to performances, mobile stage hire or portable stage hire are ideal for most events. WHY SHOULD I USE AV DIRECT FOR STAGE HIRE? AV Direct’s talented team of professionals can use our podiums in a magnitude of different combination’s, levels and angles. After the stage and structure is safe, it can be completed with stairs and even railings if needed. Our structural engineers can construct, approve and certify the structures where needed. Stage hire for events, concerts and festivals throughout South Africa. Whether you require a simple stage or a complete stage set for your event, we believe in only providing the best equipment and the best customer service. Great sound is the foundation of any venue, but if you really want to take your show or event to the next level then give your audience the full sensory experience. Pairing great audio with an equally great set of stage and lighting effects will have a very powerful impact on your audience. It creates unique prospective, focus, enhances the mood and sets the tone of your event. Live performances, stage shows and DJ events all rely on lighting to reinforce the overall impact and make the audience feel like part of the show. Experience makes a big difference. From the simplest background lighting to the most complex 3D effects using strategically-positioned laser lights and fog machines, AV Direct’s Stage Lighting service will leave your audience awed and amazed! Stages are distinctive rentals and often need additional attention. We provide consultation, coordination with other event providers, delivery & setup of stage rentals, and pick-up. 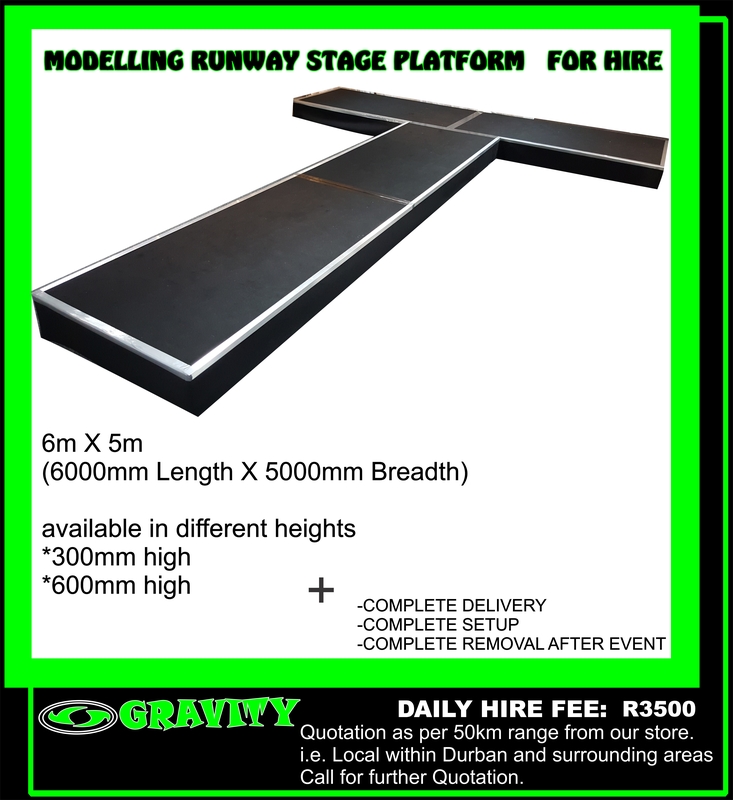 If you need to rent a stage, stage riser, platform, multi-level platform, stage with railings and steps, or even a fashion show runway ... you have come to the right place. Marquee Tent Events can create the perfect stage to make your event memorable. Virtual Productions provides a number of stage hire and stage rental options to the South African market. In conjunction with the stage hire we also provide stage design services and have done some major music events throughout Southern Africa. Due to the versatility of our stages, they can also be used for indoor events. We have a large selection of stage hire decking available for hire. These can be added onto already existing hire stages to create larger performance area, or an alternative designs of stage hire. We can also offer catwalk hire for fashion shows, or single platform hire for public speakers. We provide modular stages and decking and can help with various types and configuration stages and structures as the event requires. The stages are normally rented with crew but can also be done on a dry hire basis if that is the requirements. We own our our truck for stage transport so the stages can be set up anywhere in South Africa and other Southern Africa countries. Welcome to Stage Hire Hub! We hire or rent out stages for indoor and outdoor events. No order is too big or too small and we will stop at nothing to deliver exceptional service at the best price. 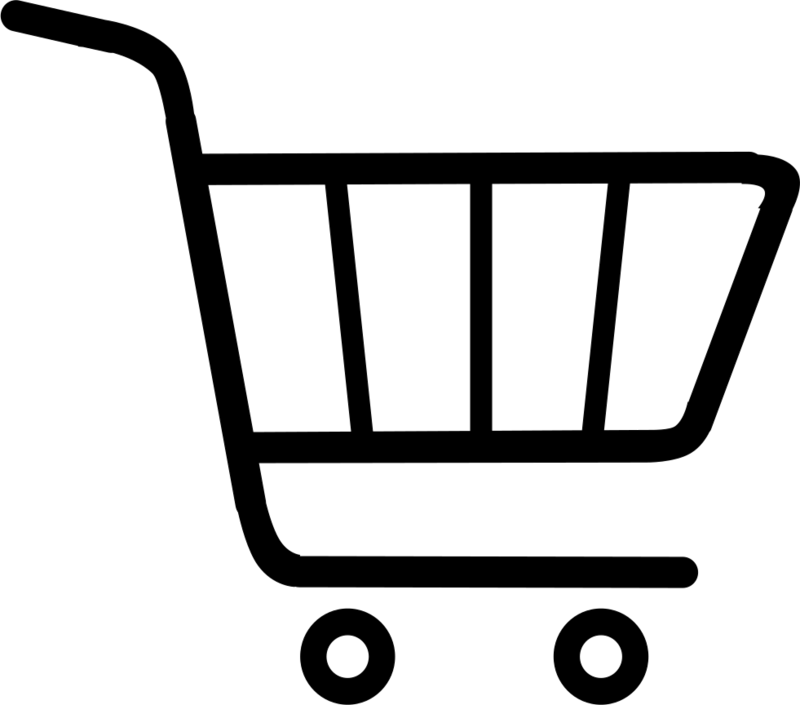 See our product list above. Click to order by category. To order call us on 072 418 3656 or email victor.stagehirehub@gmail.com for stage hire, sound hire, av hire, pa hire, fencing hire and more. We have included prices just to give you a rough idea of costs. 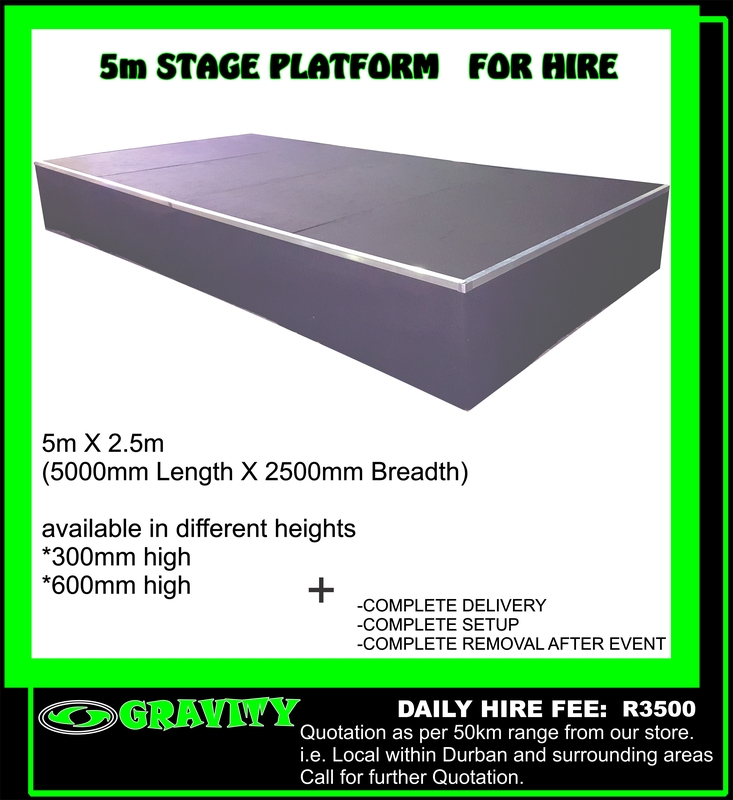 Please note that these prices exclude set-up, strike and transport costs.ll your stage hire, sound hire, av hire, pa hire, stage lighting, generator hire, stage ramps, fencing, expertise under one roof. To order call me, tage hire was established in 2012 by Bonginkosi Mpupu registered in 2011 under the name of Ncuma Music which was formed in 2010, just after the South Africa first world cup Soccer Tournament as an Artist management and booking agency company. we supply malls, schools, churches, hotels, clubs, festival, concerts, Exhibition stands, Road Show, fundraising, corporate clients, fashion shows, Dj battles, birthday parties, matric dances events, year end function, conferences and any other events. Platforms make up 90% of the work we do. They're extremely durable (rated for over 2 tonnes per deck) and quick to construct. They come in all shapes and sizes, including circles and triangles, allowing us to create almost any shape under the sun. We also supply a number of accessories, including handrail, treads and hard and soft fascia for finishing. We use scaffold bracing to ensure even the tallest of structures are stable and safe. Give us a call, and we'll tell you all about our magnificent safety ratings. ur tiered seating structures are quick and flexible, with seating specially designed for indoor and outdoor uses. We can build to any rise height you require, at any angle, and in awkward spaces. And now for the first time we offer a range of tip-up seating that's tailor made to work with our deck, which means the installation goes up in a flash. The stand is clad with simple and elegant black casement, creating the perfect platform for our smart tip-up seats. If you'd like to know more, give us a call. Steeldeck is now stocking Lite-Deck! With an aluminium frame and a lighter ply on top, these platforms weigh a good 20kg less than our original Steeldeck. The clean aluminium looks great even without facia- perfect for when you want to leave the decks on show. It's not quite as tough and rugged as the original Steeldeck, but with a 5kN/m2 rating you can rest assured it will still take the strain. If you're building something tall, our new Layher system is ideal. With a ground-up build method it's quick to install, flexible and lightweight. This system is ideal for camera risers for film sets, since it's built with an internal staircase, meaning it takes up as little space as possible. Like all our products, it's highly safety rated, which should keep the structural engineers happy. Spider deck is an extremely lightweight alternative to Steeldeck. It goes up in a flash, and comes in a number of different heights, meaning it can adapt to your every need. They consist of a pop up three-dimensional lattice of aluminium tubes supporting a folding panel top. This doesn't just sound impressive; it also gives the deck one of the best strength to weight ratios around. A perfect small stage for a private party. Number 1 Kasie supplier of DJ equipment & PA system new and used!! !